I recently completed a survey of over 1,200 U.S. consumers to find out exactly what they think “natural” means when evaluating different foods. The full report is available here and topline results for all questions asked are here (the survey also covered consumers’ perceptions of “healthy” claims, which I’ll blog on later). One of the initial queries was an open-ended question which asked, “What does it mean to you for a food to be called ‘natural’?” Here is a word cloud constructed from the responses. Words like artificial, additive, chemical, and organic were most commonly mentioned. More than 10% of respondents specifically mentioned the word artificial. A non-trivial share of respondents suggested the word was meaningless, marketing hype, or that they did not know what the word meant. Respondents were also provided a list of possible words/definitions and asked which best fit their definition of natural. No preservatives and no antibiotics/hormones topped the list. Despite associating preservatives with lack of naturalness, when asked about specific preservatives, responses are more nuanced. Preservation by canning and with sugar/salt/vinegar were perceived by more people as natural than not-natural, whereas preservation with benzoates/nitrites/sulphites was not. You can find some colorful heat-maps of the resulting clicks in the full report. Here, I’ll just note that about half of respondents (47.1%) clicked on the image of the raw commodities as being natural. The next most commonly clicked areas, chosen by between 20% and 30% of respondents, was grits/oatmeal, wash/clean, and wash/grind/slice. Even after showing the processes involved, 19.8% clicked vegetable oil as natural and 13.3% clicked flour as natural. By contrast, “Bleach” was most most frequently clicked (by 33.8% of respondents) as not natural, followed by “Crystalize”, and then alcohol, syrup, and sugar. A curious result revealed is that, in many case, final foods are often considered more natural than the processes which make them. For example, more people clicked alcohol as natural than clicked fermentation as natural. Vegetable oil was perceived as more natural than pressing or bleaching, both processes which are used to create this final product. Similarly, sugar is perceived as more natural than crystallization, but of course, the latter is necessary to produce the former. These findings suggest that it is possible for a final product to be considered natural even if a process used to make the product is not. I also asked questions about crop production processes and perceptions of naturalness. About 80% more respondents said organically grown crops were natural as said such crops were not natural. Crops grown indoors and that are hydroponically grown were, on net, seen as more natural than not. 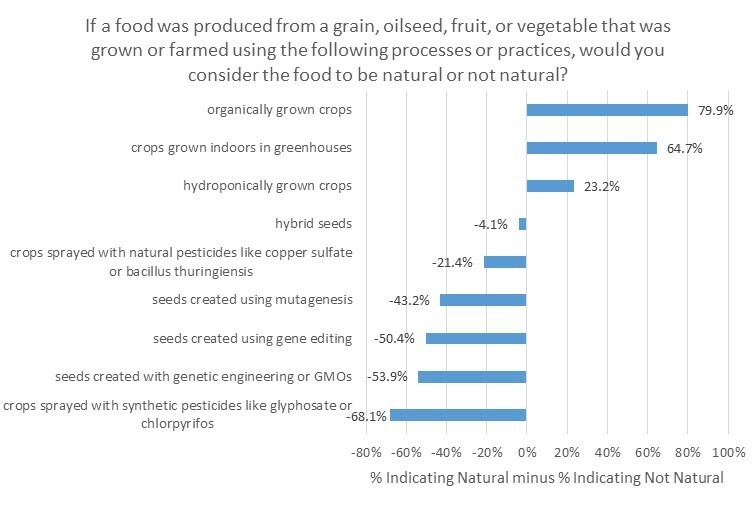 All other crop production practices were rated as not natural by more respondents than were rated as natural. Thus, the results suggest consumers are skeptical of the naturalness of most modern crop production practices. Curiously, this is true for use of hybrid seeds. Crops produced with biotechnology were much more likely to be considered not natural than natural. Consumers perceived organic as natural, but not the pesticides used in organic agriculture or the methods (i.e., mutagenesis) used to create many organic seeds. Again, these findings suggest that it is possible for a final product to be considered natural even if a process used to make the product is not; in this case, the finding is likely to result from a lack of knowledge about organic production practices. On the topic of misperceptions, just because a federal definition of natural exists does not mean consumers know or understand the definition. The USDA currently defines “natural” for meat products, and it is primarily defined as “minimally processed.” However, only about a quarter of respondents in this survey (26.6%) correctly picked this definition when asked how the USDA defines the term. More than 30% of respondents incorrectly believed the USDA definition of natural implies “no hormones” and 23.8% thought a natural label implies “no antibiotics.” These data suggest more than half of respondents are misled by the USDA definition of natural, a result supported by the other recent academic research. There is a lot more in the detailed report, including more information on question wording and methods of analysis. For example, analysis of correlations between responses (via factor analysis), suggests “natural” is not a single monolithic construct in consumer’s minds, but rather is multidimensional. A food or process can be considered natural on one dimension but not another, as shown in the following figure. Thanks to the Corn Refiners Association, who funded this survey. They gave me free reign to ask the questions and analyze the data as I wanted. You can see their interpretation of the results and their policy recommendations here. Over at Bloomberg, Megan McCardle questions consumers' fascination with authentic (dare I say "natural") food. The whole thing is well worth a read. Here is an excerpt. Too, we must remember that not everyone was a good cook. Cooking was a job, not an absorbing hobby, and as with any other job, many people did it badly. Every farm wife could produce enough calories to feed her family (at least, if the raw materials were available). Not all of them could produce anything you’d want to eat. Modern food-processing technology has relieved us of that most “authentic” culinary experience: boring ingredients processed by an indifferent cook into something that you’d only voluntarily consume if you were pretty hungry. Even the memory of these cooks has fallen away, though you’ll encounter a lot of them if you read old novels. But, what is it that people "really want" when they eat? My research consistently shows it's, healthy, affordable, safe, tasty food; whether it is natural or "fair" or from a particular origin matters far less. I believe Sax is also mistaking what people say they want which what they actually choose. As I previously discussed via USDA statistics, the amount of farmland in organic, for example, represents a very small share of all agricultural acreage. 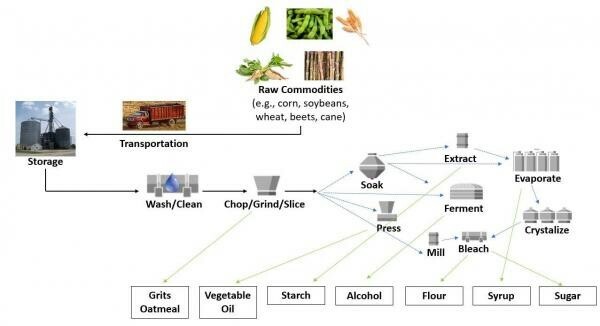 I don't deny that there is increasing demand for organic, "clean", etc., but I think Sax is mistaking what people want for the method of how it's provided. The theme of my book Unnaturally Delicious is that if we really want to tackle many of our most pressing problems in agriculture it will require exactly the sort of stuff (like math, science, engineering) that Sax says he wants to keep away from food. I can think of a lot of reasons why you'd want to "disrupt that." Because, for examples, his vision is too expensive, unavailable but for the most wealthy, too time consuming, and would use too many of our natural resources if everyone ate this way. No one I know is trying to keep these "natural" alternatives from consumers, and it is a testament to our vibrant food economy that the market provides these "natural" foods for consumers who are willing to pay for them. But, that doesn't mean we can't have Solyent too. Let me state things differently. Modern food and agricultural technologies are providing us more affordable food than at any time in our history, reducing hunger all over the world, while at the same time reducing the amount of land we need to bring into production. We're adopting new technological approaches to keep food safe, quite literally saving lives, and using science to understand how to make a more nutritious, affordable food supply even for people in some of the most impoverished places on the planet. Scientists are using math, chemistry, engineering and the like to reduce the number of animal we need to produce meat and milk, thereby reducing our carbon impacts. Why would you want to stop all of that? David Zilberman, an agricultural economist at UC Berkeley, has an interesting blog post on the slow and natural food movements. The timing of his piece is impeccable given the long, aggressive defense of the food movement Michael Pollan just wrote in the New York Times Magazine. After a bit of praise for the movements, Zilberman gets to some critiques. I've given a couple presentations recently on food trends, and in each instance I was asked whether the so-called Millennial generation thinks differently about food issues than older generations. I haven't spent a lot of time delving into this question because a lot of the willingness-to-pay research I've been involved with over the years suggests demographics don't tend to explain a lot of the variation in willingness-to-pay. But, given the interest in the subject, I thought I'd take a quick look at some of the data from the monthly Food Demand Survey (FooDS) I've been running for over three years now. In particular, I pulled the data we ask on so-called "food values." The question shows respondents 12 issues (randomly ordered across surveys) and asks respondents which are most and least important when buying food. Respondents have to click with their mouse and drag four (and only four) items in the “most important” box and then do the same for the “least important” box. appeared in the least important box. Thus, the range of possible values for a food value is from -1 to +1, where a higher number implies more importance (a +1 would mean the particular food value was placed in the most important box by 100% of respondents). This is a zero-sum scale, and it only reveals relative importance (e.g., how importance taste is compared to price) not overall importance. Ok, so here's a graphical illustration of the food values by age group (I've pulled the data over time, so each age group has several thousand observations, yielding margins of error of around +/- 0.025 importance points). Except for the oldest group, there is agreement in ranking at the top: Taste>Safety>Price. In the middle-range of importance, there is far less agreement. Both the 18-24 year old group and the 25-34 year old group could be considered Millennials according to most definitions I've seen. The Millennials place less relative importance on nutrition than the 55 and older crowd. However, the top four issues (taste, safety, price, and nutrition) are way more important than the other issues regardless of the generation under consideration. The Millennials place less importance on appearance but more relative importance on naturalness, animal welfare, convenience and environment than do older generations, particularly the 65 and older group, which compared to the other age groups, places the lowest importance on naturalness, animal welfare, and environment. There is a big divide when it comes to the importance of origin: the 65 and older group places quite a bit more importance on origin than do people who are 24 years and younger. The biggest gap is for origin (there is a 0.30 spread on the -1 to +1 scale) between the youngest Millennials and the oldest group. The next biggest gap is for naturalness (there is a 0.22 spread on the importance scale) between the oldest group and the 25-34 year old Millennials. The most agreement is for "fairness." It might also be instructive to compare all this along another demographic category: gender (margin of error here is +/- 0.014). Women place more relative importance on safety, animal welfare, and naturalness than men. Men place more importance on convenience and novelty than women. The biggest gap is for animal welfare (a 0.19 point difference on the -1 to +1 scale) and then convenience (a 0.16 difference).